For the animated TV show, see The Jackson 5ive (TV series). "The Jacksons" redirects here. For other uses, see The Jacksons (disambiguation). The Jackson 5 have sold more than 100 million records worldwide, making them one of the best-selling bands of all time. They were inducted to the Rock and Roll Hall of Fame in 1997 and the Vocal Group Hall of Fame in 1999. They were also the first group to debut with four consecutive number one hits on the Hot 100 with the songs "I Want You Back", "ABC", "The Love You Save", and "I'll Be There". The five Jackson brothers' interest in music was bolstered by their father Joe Jackson. In 1962, Joe found Tito playing with his guitar after a string broke, and he was impressed enough to buy him his own guitar. Tito, Jermaine, and Jackie later formed their own group, with Michael (age 5) playing congas and childhood friends Reynaud Jones and Milford Hite playing keyboards and drums. Marlon joined on tambourine in August 1965, when Evelyn LaHaie suggested that the group name themselves the Jackson Five Singing Group. In 1965, the group won a talent show at Theodore Roosevelt High School in Gary, Indiana. Jermaine performed several Motown numbers, including the Temptations' "My Girl", and Michael performed Robert Parker's "Barefootin'". Johnny Jackson and Ronnie Rancifer eventually replaced Hite and Jones. After several more talent show wins, Joe Jackson booked his sons to perform at several respected music venues of the chitlin' circuit, including Chicago's Regal Theater and Harlem's Apollo Theater, winning the talent competitions on both shows in 1967. They won the Apollo contest on August 13, 1967, and Gladys Knight sent a tape of the boys' demo to Motown Records, hoping to get them to sign, but their tape was rejected and sent back. In November 1967, Joe Jackson signed the group's first contract with Gordon Keith, an owner and producer of Steeltown Records, and the Jackson Five recorded and released the singles "Big Boy", sung by Michael, and "We Don't Have to Be Over 21". During early 1968, the group also performed at strip clubs on Joe's behest to earn extra income. They performed a week-long run of shows at the Regal Theater as the opening act for Bobby Taylor & the Vancouvers, and Taylor sent them to Detroit to help with their Motown audition, which was set for July 23 at Motown's headquarters on Woodward Avenue. The taped audition was sent to Berry Gordy's office in Hollywood, but Gordy turned them down again, since he had Stevie Wonder in his spotlight. He changed his mind, however, and the group signed a contract on March 11. Gordy sent them to Hollywood in July, hiring Suzanne de Passe to become their mentor. Starting in August, the Jackson Five performed as the opening act for the Supremes, whose lead singer Diana Ross was planning to leave for a solo career at the end of the year, performing at the Daisy in Los Angeles and at the Miss Black America Pageant in New York. The group then recorded their first single "I Want You Back", written by the Corporation which consisted of Freddie Perren, Deke Richards, and Alphonzo Mizell with Gordy as a fourth partner. In October, their first single for Motown was released and the group promoted it while performing at the Hollywood Palace with Ross hosting. In December, the brothers made their first appearance on the Ed Sullivan Show, and their debut album Diana Ross Presents the Jackson 5 was released that same month. "I Want You Back" topped the Billboard Hot 100 in January, 1970. The Jackson 5 released two more number-one singles led by the Corporation: "ABC" and "The Love You Save". The single "I'll Be There" was co-written and produced by Hal Davis and became the band's fourth number-one single, making them the first recording act to have their first four singles reach the top of the Hot 100, and all four were almost as popular in other countries as they were in the United States. The group released a succession of four albums in one year and replaced the Supremes as Motown's best-selling group. They continued their success with singles such as "Mama's Pearl", "Never Can Say Goodbye", and "Sugar Daddy", giving them a total of seven top-ten singles within a two-year period. The Jackson Five became Motown's main marketing focus and the label capitalized on the group's youth appeal, licensing dozens of products, including the J5 heart logo on Johnny Jackson's drum set, the group's album covers, stickers, posters, and coloring books, as well as a board game and a Saturday morning cartoon produced by Rankin/Bass. The black publication Right On! began in 1971 and focused heavily on the Jackson 5, with members adorning covers between January 1972 and April 1974. In addition, the group appeared in several television specials including Diana Ross' 1971 special, Diana!. They starred on their first of two Motown-oriented television specials Goin' Back to Indiana in September; their second was The Jackson 5 Show which debuted in November of the following year. The group often joined Bob Hope on USO-benefited performances to support military troops during the Vietnam War. In order to continue increasing sales, Motown launched Michael Jackson's solo career in 1971 with the single "Got to Be There", released in November. His 1972 song "Ben" became his first to top the charts. Jermaine was the second to release a solo project; his most successful hit of the period was a cover of the doo-wop song "Daddy's Home". 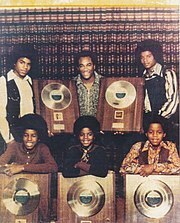 The Jackson 5's records began plummeting on the charts by 1972, despite Michael and Jermaine's solo successes. The Corporation had produced most of their hit singles, but they split up in 1973. The brothers focused on the emerging disco craze and recorded the song "Get It Together", followed by their hit "Dancing Machine", their first to crack the top ten since "Sugar Daddy" nearly three years before. Despite those successes, most of the Jackson 5's follow-ups were not as successful, and Joe Jackson grew tired of Motown's uneasiness to continue producing hits for the brothers by 1973. He began producing a nightclub act around his sons and daughters, starting in Las Vegas and spreading throughout the states. By 1975, most of the Jacksons opted out of recording any more music for Motown, desiring creative control and royalties after learning that they were earning only 2.8% of royalties from Motown. Joe Jackson began negotiating to have his boys sign a lucrative contract with another company, settling for Epic Records which had offered a royalty rate of 20% per record; he signed with the company in June 1975. Absent from the deal was Jermaine Jackson who decided to stay in Motown, followed by his marriage to Hazel Berry, and Randy Jackson replaced him. Motown sued them for breach of contract but allowed the group to record for Epic, as long as they changed their name because Motown owned the name Jackson 5. The brothers renamed themselves the Jacksons. Michael Jackson with President Ronald Reagan and first lady Nancy Reagan at the White House in 1984. Jackson became a global superstar following his departure from The Jackson 5. In November 1976, following the debut of the family's weekly variety series, the Jacksons released their self-titled CBS debut under the Philadelphia International subsidiary, produced by Gamble & Huff. Featuring "Enjoy Yourself" and "Show You the Way to Go", the album went gold but failed to generate the sales the brothers had enjoyed while at Motown. A follow-up, Goin' Places, fizzled. Renewing their contract with Epic, the Jacksons were allowed full creative control on their next recording, Destiny, released in December 1978. Featuring their best-selling Epic single to date, "Shake Your Body (Down to the Ground)", written by Michael and Randy, the album sold over a million copies. Its follow-up, 1980's Triumph, also sold a million copies, spawning hits such as "Lovely One" and "Can You Feel It". In 1981, they released their fifth album, a live album that eventually sold half a million copies. The live album was culled from recordings of performances on their Triumph Tour. In between the releases of Destiny and Triumph, Michael released the best-selling solo effort, Off the Wall. Its success led to rumors of Michael's alleged split from his brothers. After Triumph, Michael worked on his second Epic solo release, which was released in November 1982 as Thriller, which later went on to become the best-selling album of all time, winning eight Grammy Awards including Album of the Year, plus two number one hit singles "Billie Jean", and "Beat It", and three breakthrough MTV music videos "Billie Jean", "Beat It", and 14 minute zombie-themed music video "Thriller". In March 1983, with Jermaine, the Jacksons performed on Motown 25: Yesterday, Today, Forever, the same show where Michael debuted the moonwalk during a solo performance of "Billie Jean". Following the success of the reunion, all six brothers agreed to record a sixth album for Epic, later released as Victory in 1984. Their biggest-selling album to date, it included their final top ten single, "State of Shock". The song was actually a duet between Michael and Mick Jagger and didn't feature participation from any other Jackson besides Marlon and Jackie who were credited as background vocalists. Most of the album was produced in this way, with each brother essentially recording solo songs. Another hit was the top 20 single "Torture", a duet between Michael and Jermaine, with Jackie singing several parts. In the same year, the brothers participated in filming a Pepsi commercial where Michael suffered burns to his scalp due to a pyrotechnic fault. In July 1984, the Jacksons launched their Victory Tour, which was overshadowed by Jackie's leg injury, ticket issues, friction between the brothers, and a shakeup in the promotion and marketing team, initially headed by Don King, who was later fired. Michael announced he was leaving the group after their final performance at Dodger Stadium that December to continue his solo career. The following January, Marlon Jackson also announced he was leaving the group to pursue a solo career. In 1989, five years after their last album, the remaining quartet of Jackie, Tito, Jermaine and Randy released 2300 Jackson Street, which performed badly on the charts. After a brief promotional tour, the band went into hiatus and never recorded another album together. In September 2001, nearly 17 years after their last performance together, all six Jackson brothers reunited for two performances at Madison Square Garden for a 30th anniversary special commemorating Michael's solo career, which aired in November. 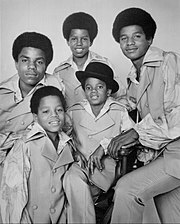 In early 2009, the four elder brothers began filming a reality show to make their attempt on reuniting the band, later debuting in December 2009 as The Jacksons: A Family Dynasty. During the middle of the project, Michael had announced his concert comeback in London was scheduled on July 13, 2009. Michael died that same year on June 25, putting efforts on halt. Later in 2009, following the death of brother Michael, the surviving Jacksons recorded background vocals for a previously unreleased song, "This Is It" (the theme for the movie of the same name), which had originally been a demo. The radio-only single was released in October of that same year. The song did not chart on the Billboard Hot 100, but charted at number nineteen on Billboards Hot Adult Contemporary Tracks. "This Is It" returned the Jacksons to the chart. The surviving members of the Jacksons were in talks of planning a reunion concert tour (which was to serve as a tribute to Michael) for 2010, and were in talks in working on their first new studio album in over 20 years. However, neither plan was put into action. In September 2010, Jermaine Jackson held his own "tribute" concert to Michael in Las Vegas. In 2011, Jackie Jackson released a solo single to iTunes, while Jermaine released his first solo album in 21 years, I Wish U Love. Following the release of one solo album, Marlon quit the music business in 1989 and invested in real estate. Randy has not been active in the industry since he disbanded the group Randy & the Gypsys in 1991. In August 2011, there appeared to be a discord between the brothers concerning a tribute concert dedicated to Michael. While Jackie, Tito and Marlon were present alongside mother Katherine and sister La Toya for a tribute concert in Cardiff at the Millennium Stadium for a press conference concerning the tour, a couple of days after the press conference, both Randy and Jermaine issued a statement denouncing the tribute tour as the date of it occurred around the time of Conrad Murray's manslaughter trial in relation to Michael's death. The show carried on with Jackie, Tito and Marlon performing without Jermaine. In April 2012, Jackie, Tito, Jermaine and Marlon announced that they would reunite for several United States concerts for their Unity Tour. Thirty-eight dates were announced, however, eleven shows in the U.S. were canceled. The tour started at Casino Rama in Orillia, Ontario, Canada on June 20, 2012. Thirty-two additional dates were eventually added, and the tour ended on July 27, 2013 in Atlantic City, United States. In 1977 the Jackson 5 were among a small group of artists eligible to receive the newly minted Madison Square Garden Gold Ticket Award for selling over 100,000 tickets to their concerts there. They received the award from Madison Square Garden when they played there as The Jacksons in 1981. In 1980 the brothers were honored with a star on the Hollywood Walk of Fame as the Jacksons. As the Jackson 5, they were inducted into the Rock and Roll Hall of Fame in 1997 and the Vocal Group Hall of Fame in 1999. Two of the band's recordings ("ABC" and "I Want You Back") are among the Rock and Roll Hall of Fame's 500 Songs that Shaped Rock and Roll, while the latter track also included in the Grammy Hall of Fame. On September 8, 2008, the Jacksons were honored as BMI Icons at the annual BMI Urban Awards. In 1992, Suzanne de Passe, Jermaine Jackson, and Jermaine's then common-law wife Margaret Maldonado, worked with Motown to produce The Jacksons: An American Dream, a five-hour television miniseries broadcast based on the history of the Jackson family in a two-part special on ABC. Influenced by the Temptations, the Supremes, James Brown, Frankie Lymon & the Teenagers and Sly & the Family Stone, the group eventually served as the inspiration for several generations of boy bands, including New Edition, Menudo, New Kids on the Block, N*SYNC, the Jonas Brothers, Backstreet Boys, One Direction, and many more. The rise of the Jackson 5 in the 1960s and 1970s coincided with the rise of a very similar musical family, the Osmonds. The Osmonds had risen to fame as regular performers on The Andy Williams Show; Jay Osmond would later note: "Michael had a unique sense of humor about him, and told us he was so tired of watching the Osmonds on The Andy Williams Show. He explained this was something their father had them do, and Michael joked he became really tired of it!" The song "One Bad Apple", written by George Jackson, who had the Jackson Five in mind when he wrote it, was originally presented to Motown Record's Chairman of the Board Berry Gordy for the group to record, but he turned it down. It was then presented to MGM Records for the Osmonds. "One Bad Apple", which the Osmonds recorded in a similar style to the songs of the Jackson 5 at the time, reached number one and began a string of several hits for the Osmonds. Both bands followed a similar career trajectory: a string of several hits as a group, which eventually led to a breakout star (Michael for the Jacksons, Donny for the Osmonds) becoming a solo artist, a little sister not originally part of the group also rising to fame (Janet Jackson and Marie Osmond respectively), and eventual decline as a smaller group in the 1980s. The two groups' members eventually became friends, despite public perception of a rivalry between the two and allegations that the Osmonds, white Mormon brothers from Utah, were an imitation of the black Jackson 5. ^ a b "Steeltown Records - Indiana Local Labels". 45rpmrecords.com. Retrieved 28 June 2018. ^ Gordy, Berry (July 19, 2009). Eulogy for Michael Jackson (Speech). Los Angeles, California. ^ Huey, Steve. "The Jackson 5". Macrovision Corp. Retrieved 2008-05-08. ^ Weiss, Jeff (June 18, 2010). "The Jacksons Hollywood Star Walk". LA Times. Retrieved March 1, 2018. ^ "The Jackson 5 | Biography & History | AllMusic". AllMusic. Retrieved 2017-05-02. ^ a b Mike Hale (2009-12-11). "No Longer One for All, but Still All From One". The New York Times. Retrieved 2010-03-06. ^ "New Michael Jackson song, 'This Is It', premieres online". Rolling Stones. October 12, 2009. Retrieved March 6, 2010. ^ Gary Trust (2009-10-15). "Chart Beat Thursday: Michael Buble, Michael Jackson, Kiss". Billboard. Retrieved 2010-03-06. ^ Bill Zwecker (2010-02-24). "J-Lo spins record discord". Chicago Sun-Times. Sun-Times Media, LLC. Archived from the original on 2010-02-28. Retrieved 2010-03-06. ^ Stevenson, Jane (June 21, 2012). "Casino Rama, Rama Ont. June 20, 2012". Archived from the original on January 15, 2013. Retrieved July 2, 2012. ^ Kozak, Roman (August 29, 1981). "Talent Talk". Billboard. Vol. 93 no. 34. USA: Lee Zhito. p. 37. Retrieved April 1, 2019 – via Google books. ^ "Music muse". Erie Times-News. May 6, 1999. Retrieved August 25, 2009. ^ "500 songs that shaped rock". The Denver Post. September 3, 1995. Retrieved August 25, 2009. ^ "BMI Honors The Jacksons, T-Pain and Many More at Urban Awards in Los Angeles". bmi.com. Retrieved 2010-10-15. ^ "Jay Osmond Official Website". Jayosmond.com. Archived from the original on 2010-11-24. Retrieved 2010-06-25. ^ "One Bad Apple by The Osmonds". Songfacts.com. Retrieved 28 June 2018. ^ "The Osmonds - Hot 100 History". Billboard.com. Billboard. March 1, 2018. Retrieved March 1, 2018. Brooks, Darren (2002). Michael Jackson: An Exceptional Journey. Chrome Dreams. ISBN 1-84240-178-5. Bierbaum, Tom (November 18, 1992). Week's Nielsen win easy as ABC[dead link]. Variety. Green, Dave (producer/director). (January 29, 2005). VH1 News Presents: Michael Jackson's Secret Childhood [television broadcast]. New York, NY: MTV Networks. Neely, Tim (2000). Goldmine Standard Catalog of American Records 1950-1975 2nd Ed. Iola, WI: Krause. ISBN 0-87341-934-0. Wikimedia Commons has media related to The Jackson 5. "The Jackson 5". Rock and Roll Hall of Fame.